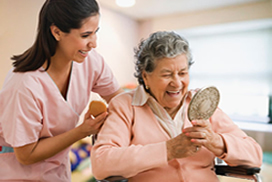 Special Touch Living Residential Care Home believes that people stay healthier and happier when they are able to continue living in a healthy home environment. Visit our reviews page to find out what others are saying! Our promise to you means that we offer a wide range of services and amenities to help you and your loved one maintain independence while being safe. We will provide you complete care while enjoying the comfort, security, and health of living in a family home. Three delicious meals a day – Therapeutic diets provided. Three nutritious snacks a day. Aside from our attractive activities program, we take pleasure in making sure that our residential home bears no resemblance to an institutionalized facility. We take pride in offering our residents a lavishly decorated home with hardwood floors throughout and nice carpeting in the bedrooms.